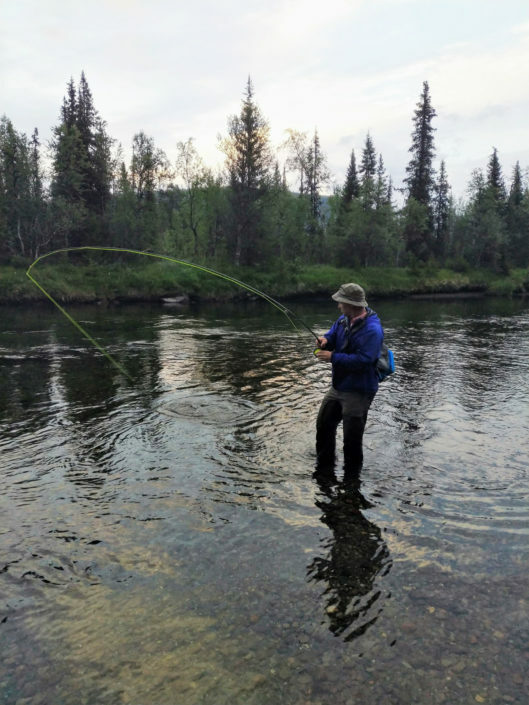 Join Saveur the Journey for a Fly Fishing adventure in the Land of the Midnight Sun. Swedish Lapland North of the Arctic circle is a unique place because of its natural beauty, remoteness, 24 hour daylight, and excellent fishing for large wild populations of Arctic char, brown trout, and Arctic grayling. Experience the adventure of Lapland where we can safely drink water straight from the streams, eat reindeer steaks and moose burgers, take a wood fired sauna next to a river, and lose ourselves in the spontaneity of endless daylight in nature. We will use helicopters to fly into remote cabins that afford us access to mountain rivers and lakes with un-pressured populations of wild fish, hungry to sip dry flies or hammer nymphs and streamers. Local guides will show us the flies and techniques to stalk and catch the three main salmonidae species of the Arctic. Professional guides will help everyone catch fish. Meet local people who will show us the upper limits for coffee consumption and how to take a real Swedish Sauna. Small groups allow tailored experiences and high level of service. 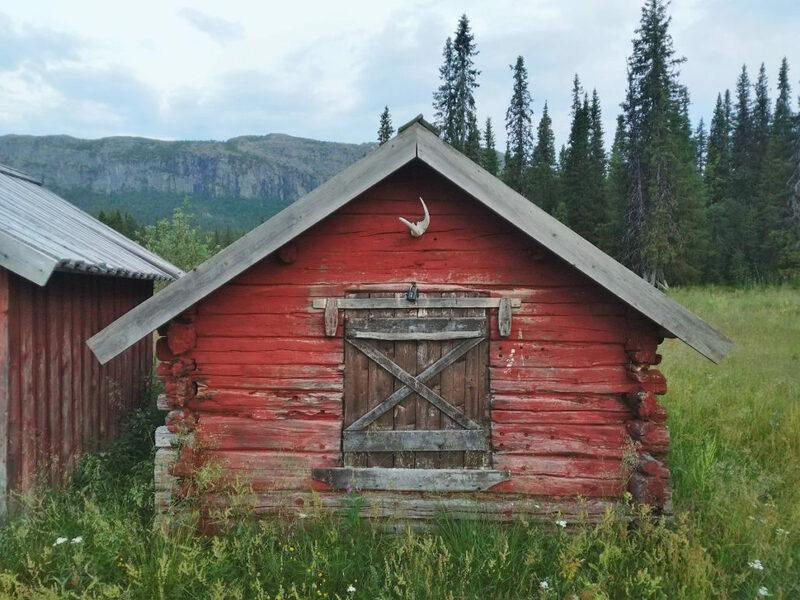 We will fly by helicopter over lakes, rivers and mountains to head guide Vidar Segerström’s remote private wilderness fishing cabin situated on the Tsielekjåhkkå river that will become our base-camp. 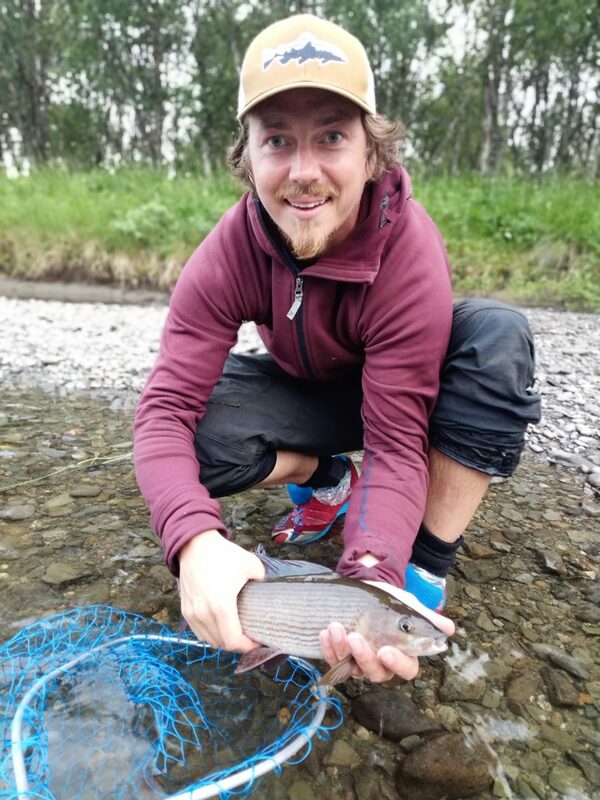 We will fish several sections of the Tsielekjåhkkå river for brown trout and Arctic grayling. We will also day hike to a mountain with a magnificent view and fish several small lakes for trout and Arctic Char. For a change we can take a boat out on the Lake Peuraure and fish for the huge Northern pike, delicious perch, and big trout that inhabit is cool waters. We will also have the opportunity to venture to the high mountains in Padjelanta National Park and stay in the Sami camp on Kutjaure (a lake) with good access to the Vuojatadno river, well known for its large Arctic char. With snow remaining on the high peaks well into July, the high mountains are where the reindeer go to escape the mosquitoes and calve. 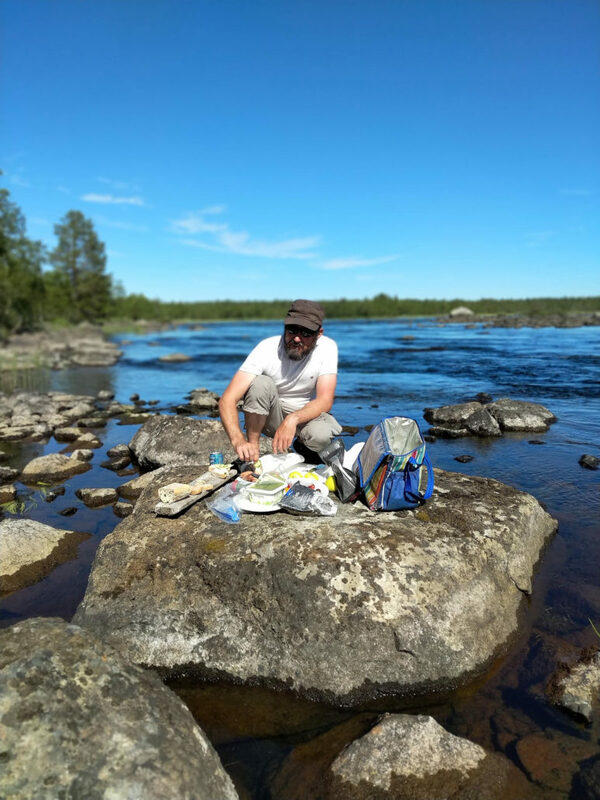 We may also be able to float the Pearl river near Jokkmokk which is a good place for Arctic grayling and brown trout and even the chance to catch a big Northern Pike on a fly rod! 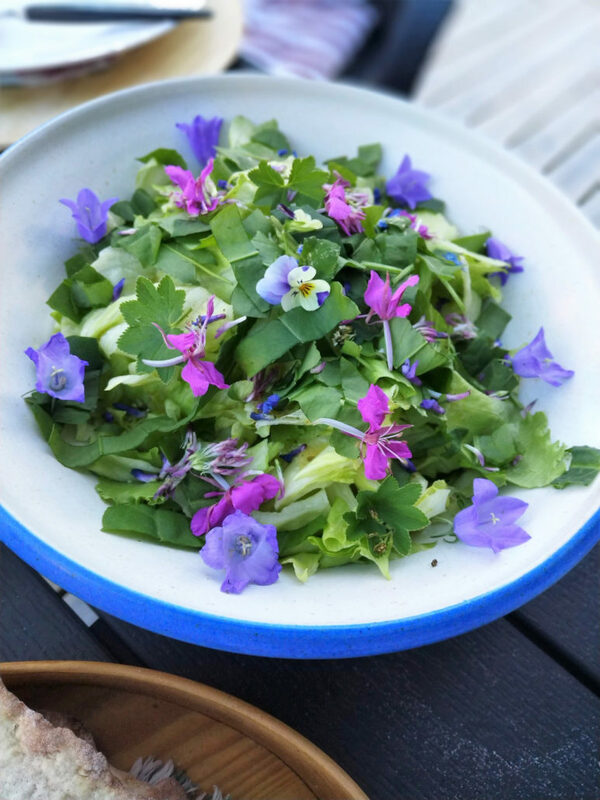 We will eat remarkable food prepared by Sami Chef Kristoffer Åstrom of cafe Gasskas, whose approach to traditional wild foods with a blend of ancient and modern techniques sets him apart as one of the best chefs of Northern Sweden. Eva Gunnare, taste creator, wildcrafter, and owner of “Essence of Lapland” will prepare a delicious meal with ingredients from the Arctic with an emphasis on Eva’s amazing foraged delicacies. We will dine on the abundance of wild foods that can be found all around us: Souvas (the Sami delicacy of salted and smoked reindeer meat), moose burgers and steaks, whole roasted trout, smoked Arctic char, poached grayling, firm filets of perch with parsley and butter, and the remarkable cloudberries, blueberries, and lingonberries that cover Swedish mountains. The Indigenous people, the Sami, have lived here for thousands of years by fishing, herding reindeer, hunting, gathering, and growing crops (it is warmer than similar latitudes thanks to a warm gulf stream current). It remains a wild and remote area, Jokkmokk “kommun” (municipality) is roughly the size of New Jersey with a population of 5000 people. During the winter several weeks pass without the sun breaking the horizon, making for a cold clear winter filled with twilight, northern lights, and blanketed with a thick layer of pure white snow. During the summer the reverse happens and the sun remains continually in the sky providing 24 hours of daylight. This results in rapid growth from flora and fauna. The Fjäll (Swedish mountains) burst into a carpet of edible berries, reindeer calves grow quickly, and the fish bite all the time as they hurry to fortify themselves before the cold of winter returns. Due to the remoteness and ruggedness of Swedish Lapland you must be in good physical shape and have experience hiking and camping in a variety of weather conditions. The cabins where we will stay are comfortable but rustic (no running water, wood cook stoves, small solar panel for electricity, outhouse). The sleeping accommodations in the cabins are bunk style rooms with 2-4 beds in each room. Typical days can be quite long as the constant daylight provide lots of time to fish. “Normal” schedules are thrown out and we fall into a rhythm of sleeping when we are tired, eating when we are hungry, and fishing in between. For the die-hard angler you can fish until you can’t see straight. 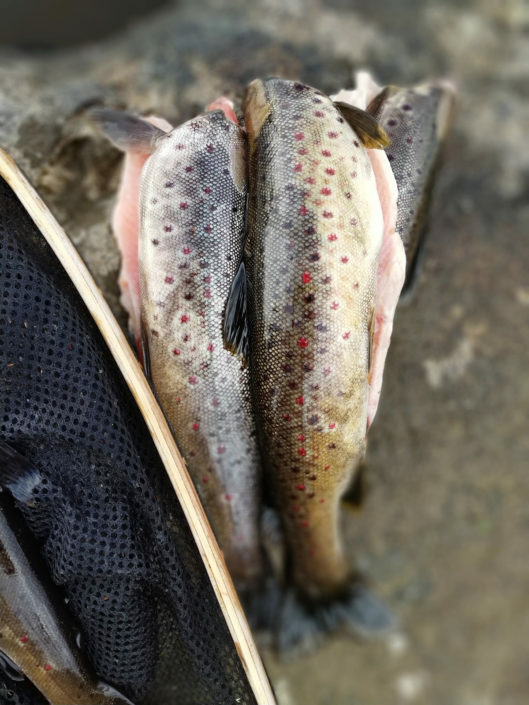 For the less enthusiastic angler there is plenty of flexibility in our schedule and other activities (hiking, berry picking, swimming, baking bread, boating, photography, reading, etc) to keep everyone happy. Swedes have a love of nature as part of their national identity. Most Swedes enjoying being outdoors in most conditions, and in Lapland those conditions can often be quite extreme. “There is no bad weather, only bad clothes” is a common Swedish saying. On this trip you will experience the Swedish way of being outside. We will not pack an energy bar or a handful of peanuts and raisins to quickly fuel ourselves for lunch. 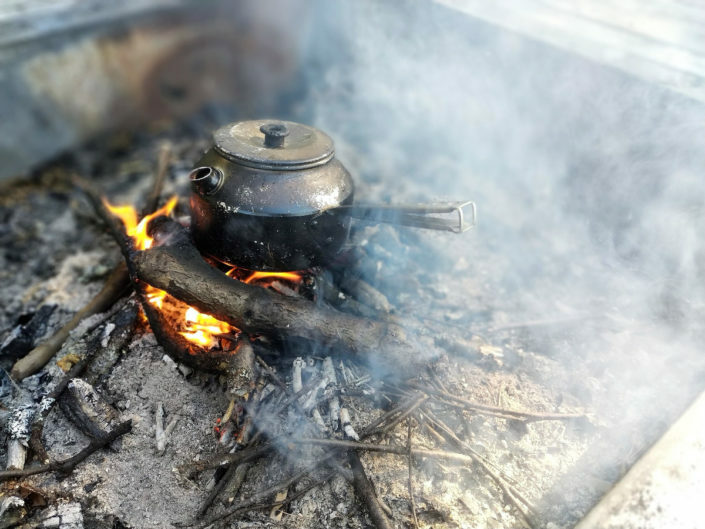 Instead often we will stop, build a fire, cook a hot meal, boil coffee, and fully enjoy the experience of eating and being outside. We will enjoy nature as a part of it, not as aliens insulated against it and longing to be back in our homes. Here we can drink the cold pure water straight from the streams. We can tie knots in fly-line at midnight without a flashlight, watch reindeer browse lichens, and eat fish fresh from the river. Vidar’s wilderness fishing cabin has a traditional Swedish Sauna on the river where we can enjoy the heat of the wood stove and the cold of a beer after a day of fishing. This trip is suitable for beginners who have never caught a fish up to expert fly fisherman/women looking to catch trophy char, trout, and grayling. The guide to client ratio is a max of 1:4, but if you would like a fully guided experience (1 guide for 2 people) that is available for a supplemental fee. All equipment (fly rod, waders, wading boots) are provided. We recommend you bring your own fly rod (5 or 6 weight) if you have one. If you bring your own boots and waders you can save $150 from the price of the trip. Participants on this Swedish Fly Fishing Adventure receive 25% off and free shipping for all your fly fishing needs at Madison River Fly Fishing Outfitters, our retail partner. Arrive at Lulea airport by 11am. Lunch at Hemmagastronomi in Lulea. Transfer from Lulea to Jokkmokk by Van (2 hours). Check into Hotel Akerlunds. Relax, visit Jokkmokk. Welcome and introduction to Lapland by “Essence of Lappland’s” Eva Gunnare. Dinner of Arctic Food with Eva Gunnare. Breakfast at Hotel Akerlunds featuring local cheeses, sausages, jams, and berries. Meet with Fly fishing guide Vidar for outfitting. Transfer by Van to Kvikkjokk (1.5 hours). Helicopter Transfer to Skaite, Vidar’s wilderness fishing cabin (or hike in the 10km if you prefer). Fish the Tsielekjåhkkå river in small groups with guides. Sleep when you are tired. Go fishing or sleep in. Breakfast at cabin at 9am. Fly fishing with guides on the Tsielekjåhkkå river. Rest and relax with drinks and appetizers. Dinner-Souvas (salted and smoked reindeer meat, almond potatoes, lingonberries, birch panna cotta). Fly fish in small groups with guides. Either fish up river or hike to small alpine lakes. Take the boat out on Lake Peuraure to stalk big trout. Pack up and leave cabin. Helicopter to Kvikkjokk (or hike out if your prefer). Helicopter to Kutjuare (or hike in if you prefer). Unpack and settle into cabins. Fishing with guides for Arctic Char or relax. Fishing with guides in small groups in the Vuojatadno river. Fish different section of Vuojatadno river in small groups with guides. Take boats out on Kutjaure and stalk big trout and char. Last chance for a trophy fish. Pack up and leave cabins. Take helicopter back to Ritsem (or hike out if you prefer). Transport by van to Jokkmokk (2.5hours). Farewell Dinner at Cafe Gasskas prepared by Sami Chef Kristoffer Åstrom. Save $150 each way if you hike instead of take the helicopter. Save $150 if you bring all of you own gear. Travel insurance (highly recommended). Try our travel partner "Travel by Lisa"
Do you have to be an experienced fly fisher to go on this trip? We can cater to all levels of fly fishing experience. Complete beginners are welcome as are seasoned veterans. 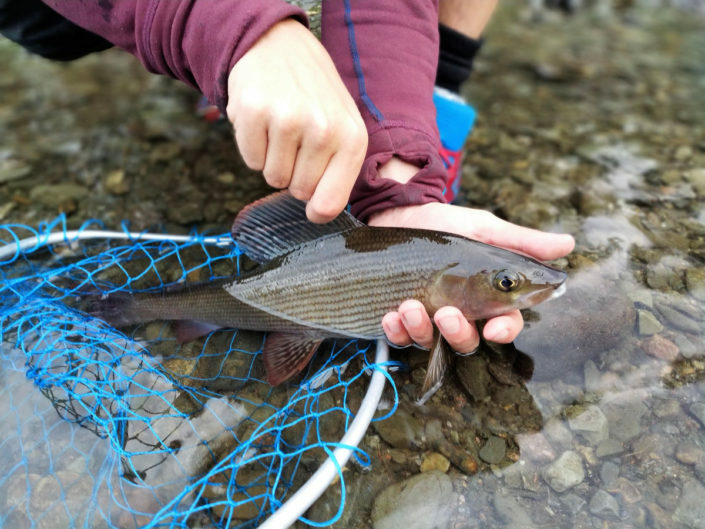 Our skilled guides will provide all the gear and instruction to help you land your first fish on a fly or help experienced fly fishers stalk a big trout, char, or grayling. Will I catch fish? Will they be big? Yes! Everyone will catch fish provided that you are fishing (you have to play in order to win). 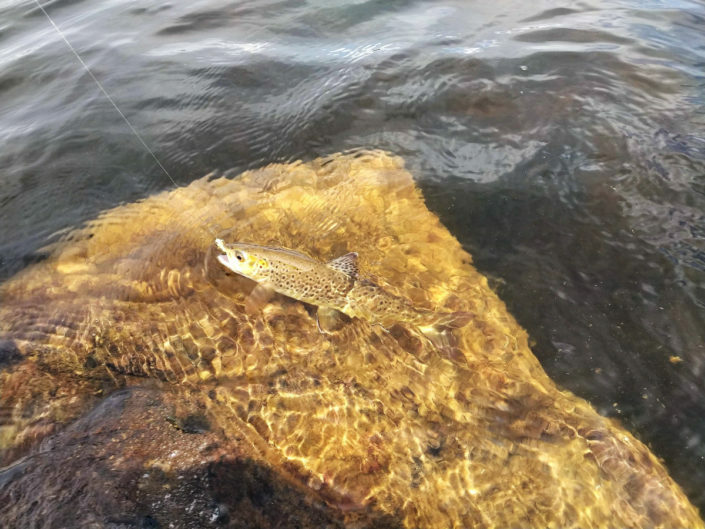 There are definitely large trout (6-8 pounds are not uncommon), grayling and arctic char, though the large one’s are often difficult to catch. The clear water often necessitates stealthy approaches in order to hook a lunker. For those who are less versed in fly fishing there is also the option of spin fishing. What will be the size of our group and how many guides will there be? The max group size is 8 and there will be at least two professional guides plus myself who can help with teaching fly fishing. This is not a “fully guided” trip (1 guide for 2 people). It is a “semi-guided” trip meaning there will be opportunities for 1 on 1 time with a guide, as well as group lessons, and time on your own to put the lessons into practice. If you would like your own personal guide, or a “fully guided” (1 guide to 2 clients) experience there will be a supplemental charge. 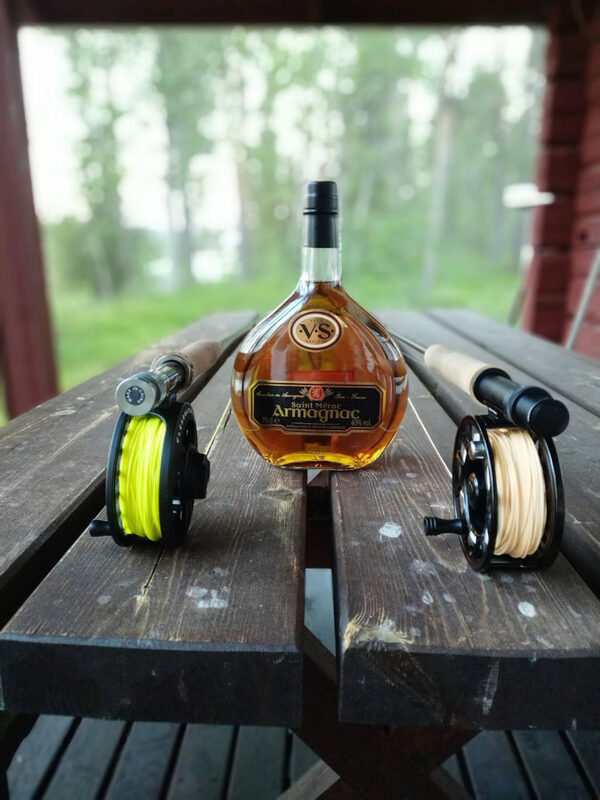 Our goal is to give you the skills you need to catch fish here in Sweden as well as when you return home to your local waters. This trip is north of the Arctic circle in Sweden. Are there polar bears, seals, icebergs, and igloos? No. While the latitude of Jokkmokk is 66.6 degrees north (Ankorage, Alaska is 61.2) it benefits from a warm gulf stream that makes for a much less harsh environment. We will be inland so there are no seals or icebergs (and there aren’t any in the sea either, though it does freeze). There are no polar bears and even the Swedish brown bears are extremely secretive and rarely seen. While occasionally one sees igloos during the winter they are usually as part of tourist activity. 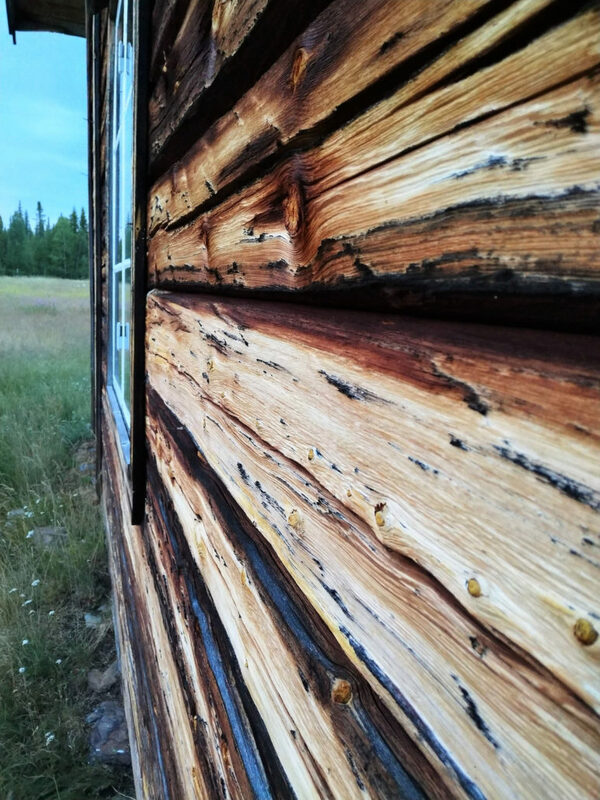 The native people, called the Sami, traditionally lived in an earthen and birch building called a Kåta. This area of Sweden has trees (birch, spruce, pine, fir, juniper, etc) and is quite lush in the summer. Temps can soar to the 80s in the summer but do occasionally hit -40F (or C) in the winter. Much of the landscape looks like parts of Minnesota, with lots of small clear lakes and lush evergreen forests. 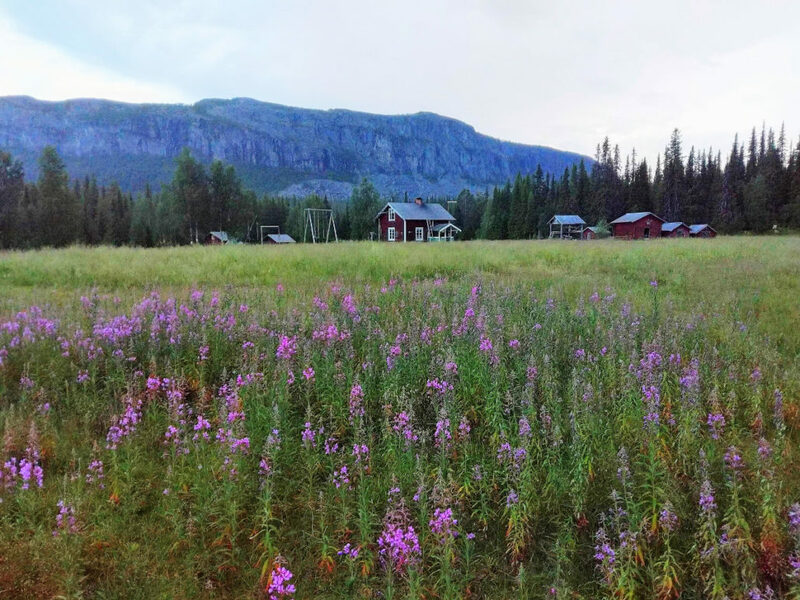 In the Swedish mountains there are less trees and the hillsides are a beautiful palette of colors. Reindeer and moose graze freely, lemmings scurry around, and even eagles can be seen. Do you have to speak Swedish to get by in Sweden or do people speak English? Of all the European countries that don’t have English as their native language I think the Swedes are the best English speakers. Virtually everyone speaks English and many people are fluent. When you say "Wild Food" do you mean you will be hunting and gathering all of our food on the trip? 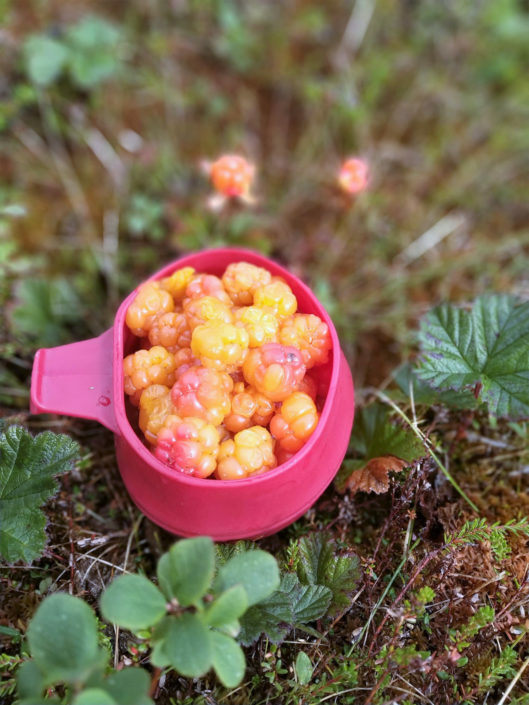 While some of the food on the trip will be taken from the landscape during the trip (such as some of the fish, and wild edibles) much of it will come from small reindeer herding and foraging operations (UtsiRen and Essence of Lappland for example). Are there mosquitoes and are they the size of birds? Yes there are mosquitoes during the Swedish summer and they can be bad at times. Luckily we will be in the mountains where there is often a breeze to blow them away. Bringing clothes that are mosquito proof is a great idea and because the weather isn’t sweltering hot wearing long pants and longs sleeves is usually not uncomfortable. We will provide mosquito head nets and repellent as well in the event that they are bad. On the upside lots of mosquitoes can mean lots of rising fish. The mosquitoes are not the size of birds, they are smaller. What will the wilderness fishing cabin be like? Does it have electricity, plumbing, Wifi, cell service, and espresso machine? What will the sleeping arrangements be like? 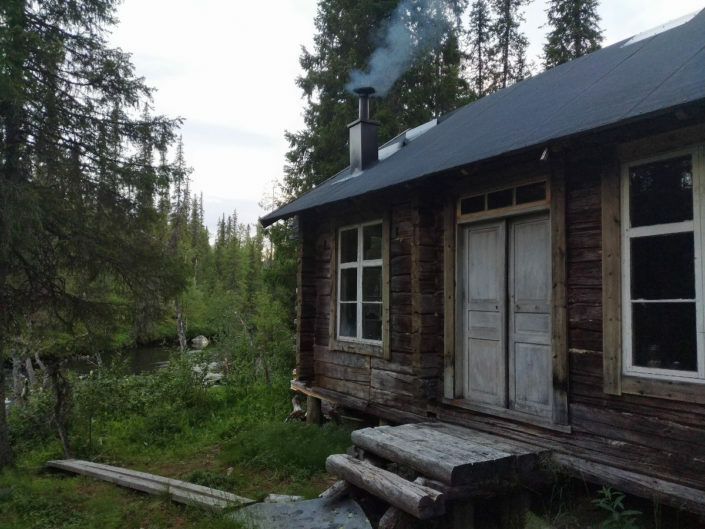 Vidar’s wilderness fishing cabin is rustic and very remote (which is one reason why the fishing is good) and has no electricity (but it doesn’t get dark out). It has a composting toilet, no cell service but does have an internet modem. 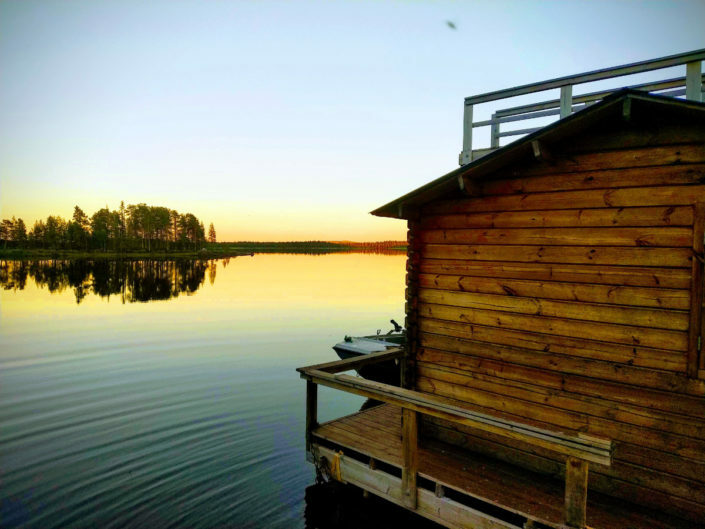 There is a traditional wood-fired Swedish Sauna right on the river where we can stay clean by taking hot bucket showers. There is a solar system for charging batteries. No espresso machine but Swedes rank number 6 in the world for the most coffee consumed per capita (the US is number 26th) so there will be no lack of coffee. The cabin has a big dining table for up to 14 people and has 9 beds in 5 different rooms. How do you sleep when it is light all the time? Most people who live in the far north become used to the constant daylight and have no problem sleeping at 3pm or 3am but it can be disorienting and difficult to sleep for some people. I recommend bringing a face-mask that will block out light. Earplugs are also good in case the sounds of nature are keeping you awake. I have my own fly fishing gear. Should I bring it? If you have your own gear that you like I would recommend bringing it. I always find it enjoyable to use my own equipment as I know exactly how it works. If you don’t particularly like your gear or don’t want to have to travel with it then leave it at home and use the gear the guides will provide. If you bring your own fly rod, waders, and boots we will knock of $150 off the price of your trip. How much hiking will be involved? What kind of shape do I need to be in? Due to the remoteness of the wilderness fishing cabin hiking will be our main form of transportation. There is a great 10 km relatively easy hike into Vidar’s cabin that is optional. We will be taking the helicopter in but if you would like to hike with the guides you are welcome to (and we can reduce the cost of your trip by $150 each way by not taking the helicopter). There is a lot of good fishing within easy walking of the cabin, but there is also a steep hike of about 4 km up to a couple of beautiful lakes with good fishing for trout and Arctic char. You should be in good physical shape, able to hike several hours while carrying a day-pack on variable terrain. This trip is for active people who enjoy being outdoors. 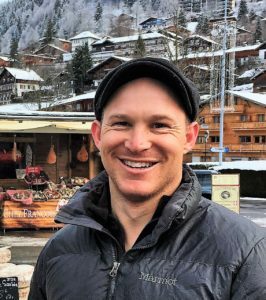 Aaron Schorsch is the owner of Saveur the Journey where he combines his passions of food, travel, outdoor adventures, and culture. He grew up in rural New Hampshire and has lived and traveled extensively in the US and abroad. Aaron learned to fish for smallmouth and trout while growing up in rural New Hampshire. Later in life he found the joys of fly fishing, learning to sight cast for rising Arctic Char while living in Swedish Lapland. Aaron is a student of food who loves cooking over open fires, blending age old techniques with ones. He loves to talk about, think about, dream about, and especially, cook and eat food. He is a member of Slow Food international and has been a US delegate at Terra Madre in Turin, Italy. Vidar is a native to Swedish Lapland, having grown up in Jokkmokk and fishing and hunting in the Swedish Fjäll. He works as a guide, as well as doing research for wind turbine farms. Vidar is an accomplished outdoor chef, owns a cafe, is a father of 3, and loves helping people catch big fish. 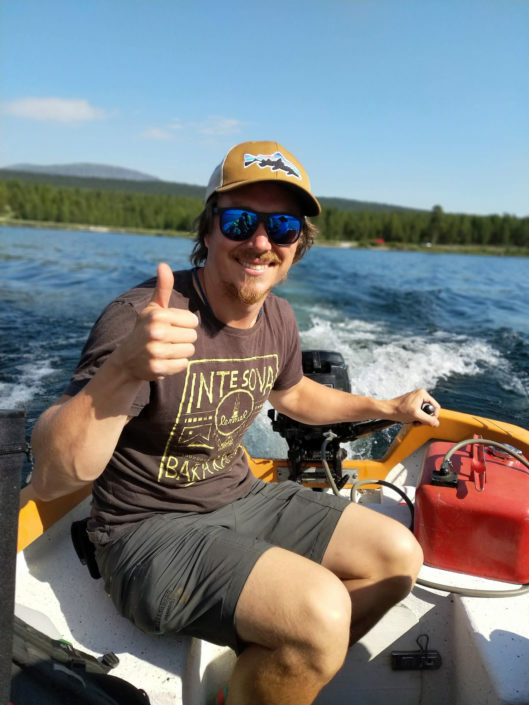 He has many skills, a quick smile, is a great problem solver, and loves boats. Vidar is spontaneous, thoughtful, and a great people person.